On Valentine’s Day 2015, Alvin Owen and Rosa Tinsley were crowned King and Queen. 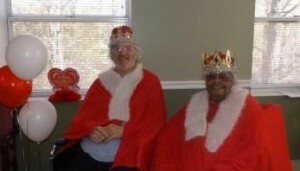 Residents and staff of Kerr Lake vote each year for a King and Queen to be crowned during our Valentine Party. 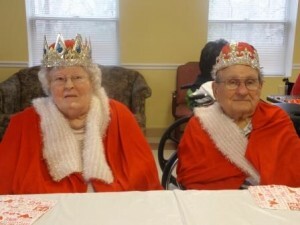 Our current ruling couple are Larry and Dorothy Jones, crowned during our 2016 Valentine’s Day Party. 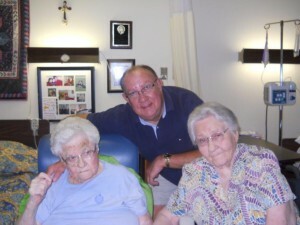 Susie Moss is one of our longest term residents here in the facility, having resided here for more than 24 years. Previously her sister, Emma, had volunteered with our activity department and the two saw each other frequently. Unfortunately Emma has been unable to visit for several years. Recently the situation changed and Emma was again able to visit with her sister. The two were excited to see each other. Emma reminisced with Susie about crafts, family and holidays. It was a joy filled occasion.